Hello and welcome to our live coverage of stage 2 of the Volta a Catalunya. Today's stage runs 179.6km from the coastal town of Mataró, just north of Barcelona, to Sant Feliu de Guíxols. We're heading to the Costa Brava today! Stage w starts in 20 minutes, with the riders setting off in the neutralised zone soon. There's climbing from the off today. The road rises from the line, before the peloton hits the third category Alt de Can Bordoi at 12.2km. Yesterday's opening stage saw Thomas De Gendt (Lotto-Soudal) take the win solo, in typical De Gendt style. The Belgian attacked his breakaway companions with over 60km left to race, holding on to win by 2:38. He holds the race lead, as well as the lead in the points and mountain classification. Max Schachmann (Bora-Hansgrohe) finished second, just ahead of the peloton, and holds the young rider's jersey. Read the full report here. The peloton has started the neutralised section of the stage now. A trio of third cateogry climbs dot the route today. Unless the breakaway makes it to the finish again, we'll likely be in for a sprint finish on the climb to the line. Michael Matthews (Team Sunweb), Daryl Impey (Mitchelton-Scott) and Alejandro Valverde (Movistar) will be among the top contenders for the win here. Jay McCarthy (Bora-Hansgrohe), Nathan Haas (Dimension Data) and Patrick Bevin (CCC Team) are other names to look out for. André Greipel (Arkéa-Samsic) and Álvaro Hodeg (Deceuninck-Quick Step) are also here, though today's finish could be too tough for them to sprint for the win. It will take some effort for anybody to overhaul De Gendt's race lead today. Barring the peloton letting the break have another extended day out, he should be safe in the white/green leader's jersey until stage 3. The stage has started and a breakaway is already away. Jonas Gwisly (Astana), Czech national champion Josef Černý (CCC Team) and Marco Minnaard (Wanty-Groupe Gobert) are two minutes up the road. 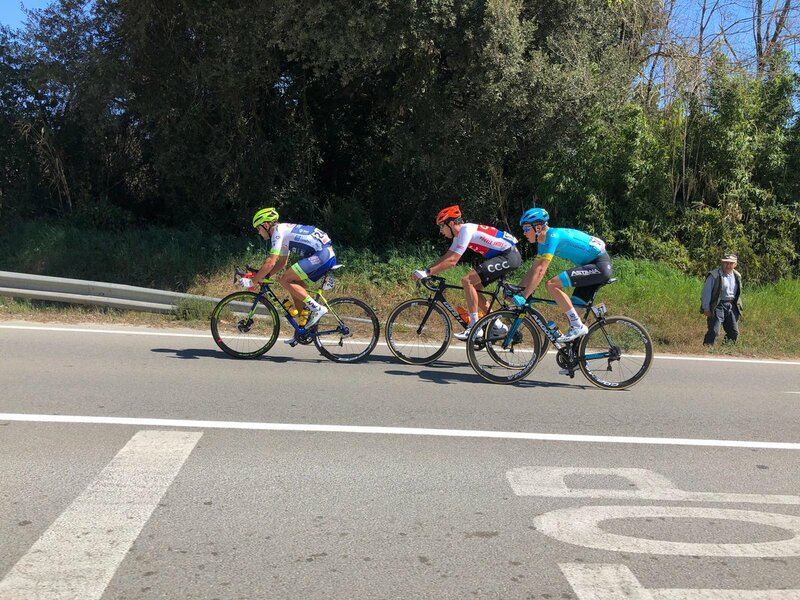 Here's a photo of the trio, from the race Twitter feed (@VoltaCatalunya). Minnaard leads Wisly and Černy over the first climb of the day. They're 5:20 up on the peloton. A short descent for the breakaway now. Then around 70km of largely flat roads until the second climb of the day, the Port de Santa Pellaia. There was a celebration at the stage start today, with the race organisation commemorating Abarca Sports, the company that runs Movistar. This year marks the 40th year in the sport for Eusebio Unzué's team, previously known as Reynolds, Banesto, Illes Balears, Caisse d'Epargne, and now Movistar. We haven't had any updates on the time gap to the break recently. The trio of Minnaard, Wilsly and Černy are still out front. Updates on the race aren't exactly coming thick and fast at the moment. While the riders make their way through these early stages of the race, let's take a look at some other news. Daniel Zamora, who won the king of the mountains title at the early season Vuelta a San Juan, has been provisionally suspended by the UCI after testing positive for EPO. Meanwhile, Wanty-Groupe Gobert Yoann Offredo remains in hospital after his crash at the GP Denain on Sunday. The Frenchman is getting "better and better" after initial concerns about the possiblity of total tetraplegia. The next climb on today's stage is the Port de Santa Pellaia, at 79.8km. The third category climb is 5.7km at an average gradient of 3.4%. The same three men are up front. They're 7 minutes up on the peloton at the moment. Lotto-Soudal and Team Sunweb are leading the peloton. Lotto for race leader Thomas De Gendt, and Sunweb for stage contender Michael Matthews. Our man in Catalunya, Alasdair Fotheringham, has sent in a weather report from the finish in Sant Feliu de Guíxols. 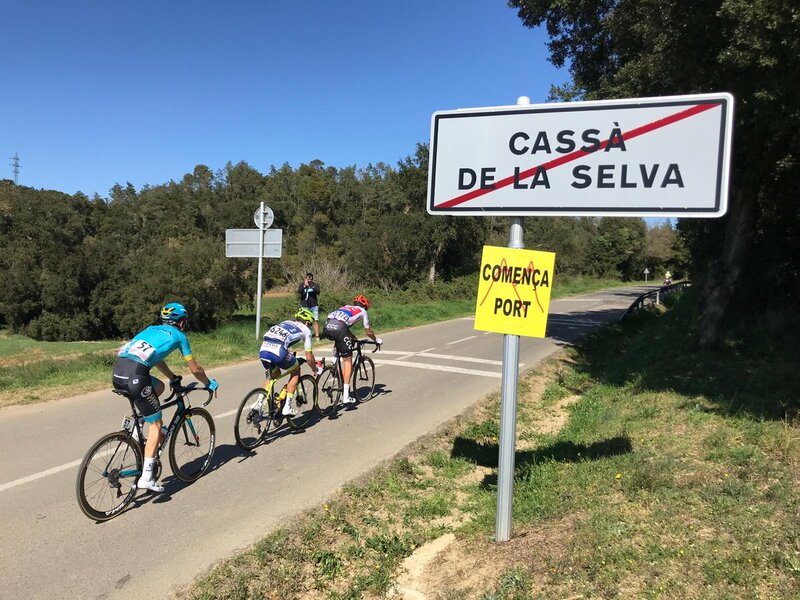 It's dry and sunny on the Costa Brava this afternoon, though there is a strong southerly wind, which would be a right-to-left crosswind on the run to the town, and a headwind on the finishing straight. The weather is due to stay warm and dry for the remainder of the week, too. That's something of an anomaly for this race, which in the past has seen stages shortened and even cancelled due to adverse weather conditions in the Pyrenees. Here's Alasdair on those weather-forced stage alterations, from our race preview. "Cancellations or shortening of some of the key stages of the Volta has often taken place in the Pyrenees and on these climbs, too. In 2018, Vallter 2000 was removed from the race because of a blizzard, and stage 5 was then drastically shortened because of snowfalls, as was the case in 2017. Back in 2012, the entire Volta was massively mutated by the removal of two key climbs on stage 3 for the same reason." 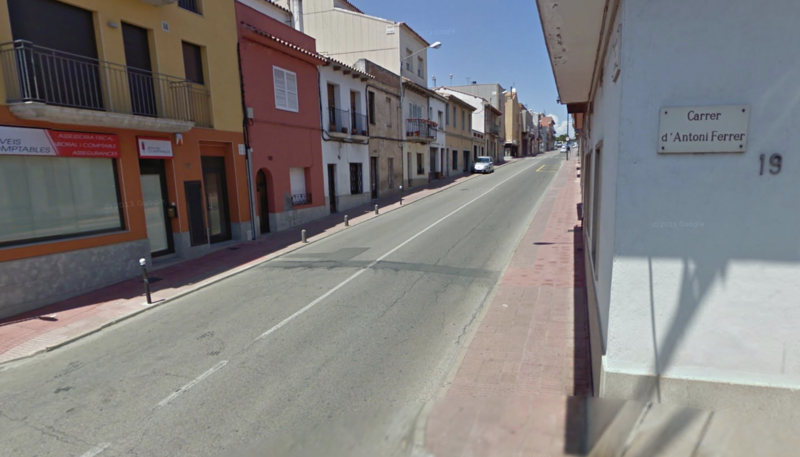 The break has just passed through the municipality of Caldes de Malavella. They'll start climbing the Port de Santa Pellaia soon. José Herrada (Cofidis) has gone down in a crash in the peloton. The Spaniard has abandoned the race as a result. Hopefully he's not too badly hurt. And the break reaches the lower slopes of the Port de Santa Pellaia. Here's the break on the climb, from the race Twitter feed (@VoltaCatalunya). They're now 74km from the finish. The peloton are still being led by a mix of Lotto-Soudal and Team Sunweb. Movistar are also visible towards the front. The gap is reportedly down to five minutes now. Once again the order over the climb is Minnaard, Wilsly and Černy. De Gendt will hold on to the lead in the mountain classification, however, after his efforts over yesterday's first category climbs. Live television coverage should be starting soon, giving us a better idea of the race situation. The break and peloton are racing to the third climb of the day at the moment. Today's stage was shortened from the original route in the area the riders are in at the moment. Originally planned to be 179km, road works saw the stage shortened to its current 166km. With 60km to race, the break are 3:50 up on the peloton. The riders will head through the finish at Sant Feliu de Guíxols before the next climb. Then follows a loop around the town, including the third category Alt de Romanyà, before they head back to finish the stage. Through the feed zone for the peloton and the gap is still coming down. They're just 2:30 behind the break now. The break are close to Sant Feliu de Guíxols now, where they'll get a preview of the finishing straight. Here's a more in-depth look at the remaining kilometres from Veloviewer. The run to the line looks to be 600 metres at around a 5% gradient. Below is a view of the finishing straight from 300 metres out. The passage through the finish line will be an intermediate sprint too, by the way. There's one more after the final climb of the day too. Under two minutes for the break now. The breakaway are on the finishing straight now, heading for the intermediate sprint. Chris Froome and the Bora-Hansgrohe duo of Jay McCarthy and Andreas Schillinger have been involved in a crash in the town. They're all quickly back up and racing though. Černy leads Minnaard and Wilsly across the line. And the road keeps climbing as they roll through. Team Sunweb lead the peloton, as further back the camera shows Froome with some road rash on his right thigh. Froome, Schillinger and McCarthy are 1:40 behind the peloton currently. Meanwhile the break's advantage is down to just one minute. 1:25 between break and peloton, actually. GPS might've gone a bit haywire there. Froome visits the team car. He's either in a decent bit of discomfort or just not in any hurry to get back to the peloton. The two Bora men left him a while ago. Froome is almost two minutes down on the peloton now. He has Caja Rural's Alan Banaszek for company. Team Sunweb continue to drive the peloton. Meanwhile the break is almost on the Alt de Romanyà, the final climb of the day. The stats for the climb – 5km at 5.4%. Froome descending in the Mohorič tuck, so he can't be feeling too stiff after the crash. He doesn't look in too much trouble, but then again, losing time today won't affect his race much. He's here for the training, while the likes of Bernal and Sosa battle it out for the overall. Ben O'Connor is also back with the Froome group. It looks like the Dimension Data man has hit the deck at some point too. Rémy Mertz (Lotto-Soudal) is there too, making it a four-man group. Černy is attacking the break, who are just 30 seconds up on the peloton. The Froome group is over three minutes down. Both Wilsly and Minnaard have blown up trying to follow Černy's attack. It looks like Černy will get to take the points over the top of the climb, at least. The peloton won't want to catch him just yet. Astana take to the front of the peloton, and Černy is duly caught just 400 metres from the top of the climb. Over four minutes back to the Froome group now. Race leader Thomas De Gendt snapped up the mountain points over the top. Downhill now, and then a few lumps en route to the uphill finish. Astana still lead the peloton. As the riders drop down the descent, here's another look at some of the contenders for the win in 15km. It did look like quite a tough ramp when the riders rolled through last time, so don't be surprised if GC riders like the Yates brothers (Mitchelton-Scott), Egan Bernal (Team Sky), Dan Martin (UAE Team Emirates) and Nairo Quintana (Movistar) are also in the mix. There's a small group hanging around 30 seconds off the back of the peloton at the moment. We haven't had confirmation of who's in the group yet. Froome's group is 6:40 down on the Astana-led peloton. Well out of it today, of course. Astana will be working for Miguel Ángel López today. Or maybe Pello Bilbao if he isn't feeling up to it. We could see quite the free-for-all on the finishing straight with the punchy sprinters and GC men all going for it. Here's a map and profile of the final kilometres. The final 600 metres average around 5%. Sky and Sunweb are up front now as the peloton approach the sprint at Platja d'Aro. Froome group now almost eight minutes back. The peloton is lined out as Sky pile on the pressure. We're in for a fast finale. They're flying along at almost 60km/h. Alejandro Valverde leads out the sprint early and there's not much in the way of competition. He takes the bonus seconds. It looked like Quintana took second, followed by a Jumbo-Visma rider. Natnael Berhane (Cofidis) has put in an attack. Here's our story on Chris Froome's crash today, by the way. Steven Kruijswijk took third in the sprint. So three seconds for Valverde, two for Quintana and one for the Dutchman. Berhane is trying his best to keep his move going, but the peloton are close behind and soon make the catch. Jumbo-Visma take to the front of the peloton alongside Team Sky now. A Catalan flag by the road confirms the headwind the riders will face in the race to the line. Jumbo-Visma lead it up a steep, but short, rise in the road. The bunch is lined out under the pace now. They're about to reach the point where Froome and McCarthy hit the deck. Hopefully there'll be no repeats of that. Michael Woods (EF Education First) and Max Schachmann (Bora-Hansgrohe) put in a few digs over the top of that last rise. They're descending now. Then some false flat from 2km to 1km before the road rises again. Schachmann has a small gap on the descent. It's certainly a twisty run-in. No chance for those at the back of the peloton to make their way up. The peloton is lined out in single-file at the moment. Tension mounting. Final kilometre! Mix of teams up front. Mix of GC men up front. Valverde, Impey, Schachmann all there. And Matthews takes the win! First win of the season for Matthews. He's had a crash-hit start to the season. Valverde took second, around a bike length behind Matthews. Impey was third. Schachmann and Odd Christian Eiking (Wanty-Groupe Gobert) were fourth and fifth. So another six seconds bonus for Valverde there, to go with three earlier on. "We really needed it. I think it's only the second victory of the year for such a big team and a team that puts so much into cycling. We really needed this – just for the confidence for the team, to know how strong we are against other teams. It's a really beautiful victory." It's the second win of the season for Team Sunweb. Cees Bol took the win at Nokere Koerse last week. We spoke to Matthews after his 12th place at Milan-San Remo, only his third racing day of 2019 at the time. He talked about his crashes at Omloop Het Nieuwsblad and Paris-Nice, and told of how he was keen to put his early season behind him. It looks like he's done just that today. He'll get a few more chances to win this week, and then Matthews is off to Flanders and the Ardennes classics. Some strong results for a few youngsters today. Schachmann is already a Grand Tour stage winner, of course. Impressive rides from Odd Christian Eiking and James Knox to take fifth and sixth today, though considering all the elite names battling for the win. Here's a shot of Matthews celebrating his victory today. Tomorrow's third stage will be a different story, with the first summit finish of the race at Vallter 2000 in the Pyrenees. A largely flat opening 110km gives way to the first category climbs of the Port d'Oix and Port de Rocabruna before the final 11km, 7.7% climb to the finish at Setcases. It'll be one for the GC men, that's for sure, and could be a race decider given the relative ease of the following stage finish in La Molina. Matthews celebrating on the podium. That's it for our live coverage of stage 2 of the Volta a Catalunya. Come back tomorrow for our full minute-by-minute stage report!